Renew nail polish rejuvenator is included in the color lock system, though it's something that goes into older bottles of nail polish rather than something that goes on the nails or is a regular part of a manicure. The items in the Color Lock system can all be purchased individually, letting people pick and choose which stuff they're going to use. 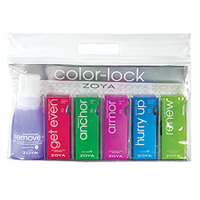 During the winter holiday season, Zoya offers a "Holiday Minicure" kit for $20, with a .25-ounce bottle of Anchor, Armor, and Hurry Up along with a 2-ounce bottle of Remove +. The bottle design...is not my favorite. I can see how it would be wonderful for someone working in a salon as they wouldn't need to tip the bottle to dispense, thus risking spillage each time; it dispenses a set amount of product with each pump; and it's just less motion. So for someone who may be giving five or six manicures a day, this is probably really fantastic. For someone who does one manicure a week...it's not so wonderful. I don't hate it, but I don't love it, either. There's no visible indicator on the lid letting you know when it's "locked" versus "unlocked", so if you go to close an unlocked bottle...you've just wasted a pump of nail polish remover. I was a bit happier when I took the cheapie route and made my own "indicator" with a sharpie. It's also not easy to pour from this bottle into a smaller bottle, for travel purposes. I'd need to use a funnel to avoid spillage. Final analysis: the polish remover is a Great Big Huge Yes-Yes-Yes, the bottle design is a "not my favorite". The refill bottle is, by far, the best deal. But if you truly love and adore the Big Flipper bottle design...rock that thing. This is step 2 in the color lock system. You use either this base coat or Anchor, but not both, for any given manicure. I tend to use a buffing block on my nails every week or so, and that keeps the ridging to a minimum. (Except for my thumbnails, which are just WEIRD. And apparently it's genetic. Thanks, Dad.) I haven't used this product, so I don't know how it performs as a ridge filler or as a base coat. I might try using it on my thumbs, though NOTHING is going to even them out completely. It would also be a bit weird to use one base coat on my thumbs and another on everything else. Final analysis: none, haven't used it. Final analysis: Anchor is now a permanent part of my manicure regimen, though I will occasionally use one of my less expensive base coats especially if I know that I'm only going to be wearing that particular color for a day or two. When I buy it again, I'll be buying the "refill" bottle and splitting that with two friends - it will cost us all less money that way, both in terms of price-per-ounce and in terms of shipping. And since we'll be splitting it three ways, we won't have to worry about the "leftover" stuff drying up before we use it. Final analysis: Armor is now a permanent part of my manicure regimen, both when I use Zoya colors and when I use other colors. I've used it with China Glaze and with Nubar, and had no problems whatsoever. Sadly, it still mutes the holographic effect of China Glaze's OMG colors...but then again, just about any top coat seems to do that. It doesn't have much muting effect on any of my duochromes, though...which is nice. I haven't tried it with my UV-activated colorchanging polishes. If you already have a top coat that you're amazingly happy with, no worries - the cost is similar to the other midrange top coats I've used, and my results were similar enough with either brand. If you're still looking for an HG top coat, though, and live where you can easily buy Zoya (either from a local store/salon, or from their website - they do not ship outside the continental US at this time) give this one a try. I haven't often found myself in the position of having to do a manicure, then ten minutes later rush out the door or change a load of laundry or herd cats or toddlers, so waiting for a manicure to dry isn't something that's really been a huge issue for me. I got some Hurry Up as part of the color lock system, but I haven't tried it yet. This is the most costly standalone item in the Color Lock system, and is also marked as "optional". Final analysis: don't know, I haven't tried it yet. And another product that I haven't used - though now if I ever need to use it, I've got a bottle. According to the web site it's specially formulated to work with nail polishes that are "big-3-free". I confess I don't know what that means, but I am guessing that the results would be different if you used this with polishes containing toluene, formaldehyde and/or dibutyl phthalates (DBP). I keep my nail polish in the refrigerator, which makes it last longer before it separates or goes all gaumy. Final analysis: don't know, I haven't tried it. I also haven't ever used any nail polish thinner or rejuvenator, so I honestly wouldn't know what results to expect. If you want a good-performing nail polish remover that doesn't dry your nails and cuticles, get a mini bottle of Remove + and try it for a few days to see if it works for you - it's worked the best of all of the nail polish removers I've tried. If you like the performance of Seche Vite and China Glaze Fast Forward top coat, but don't like the smell of either of those products...try Armor and see if you also get comparable results.